This important landmark was saved from demolition in 2000 by the City of Tybee Island and the Tybee Island Historical Society. The non-profit Friends of the Tybee Theater was created to raise the funds necessary to purchase and restore this local treasure into a cultural arts center unlike any in the Savannah area. Today, the Tybee Post Theater stands as a symbol of Tybee Island's commitment to historic preservation and the value we place on our cultural heritage. - A unique venue for your wedding, corporate meetings, private screenings, film/photo shoots. The Historic Tybee Post Theater is located at the heart of the Fort Screven Historic District at the north end of Tybee Island. Fort Screven was once home to a military base that was active from the Spanish-American War through the end of World War II. The Post Theater was constructed in 1930 by the U.S. Army as a movie house for the soldiers stationed at the Fort and was the highlight of recreational activities for the soldiers and their families and friends on the island. Built in red brick with white wooden cornices in a modest Greek revival style, the Fort Screven Theater, significantly, was one of the first theaters in the state equipped to show “talkies.” Through the years, the Theater attracted such famous patrons as base commander Gen. George C. Marshall and his wife, future President Dwight Eisenhower and Savannah’s famed composer Johnny Mercer. Officers and their families had reserved seats on the three back rows. Tybee Post TheaterAt the end of World War II, the military base was declared surplus and sold to the City of Savannah Beach, now Tybee Island, which in turn auctioned its land and many structures off to the public. Today, the Fort Screven district is an interesting mix of historic military quarters, concrete batteries, quaint cottages, new condominiums and the site of the historic Tybee Island Light Station. One of the most important remaining buildings is the Post Theater, which was operated as the Beach Theater by the family that owned the Lucas Theatre in Savannah until the mid-1960s, when the birth of the metroplex lured islanders to Savannah and the Beach Theater went dark. This important building stood vacant for the next 30 years, changing hands several times, and suffering a devastating fire which destroyed the wooden stage and much of the roof. In 1999, a developer applied for a demolition permit. Fortunately, the Tybee Historical Society realized the historical significance of the building and purchased it in 2001, saving it from destruction. That year, the Friends of the Tybee Theater (FOTT) was formed by a group of concerned Tybee citizens as a non-profit organization dedicated to the restoration of this precious asset. 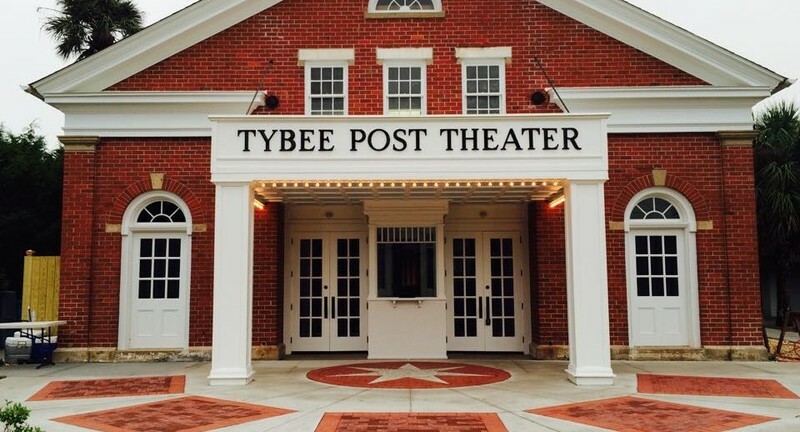 Together they launched an extensive cultural assessment and planning process and in 2006, Friends of the Tybee Theater purchased the building from the Historical Society and embarked on a mission to reopen the Tybee Post Theater and give voice, once again, to this historic treasure. And over the next 15 years, the non-profit organization worked tirelessly to raise the funds necessary to restore and reopen the Theater. SPLOST funding of $350,000 was used in 2008 to refurbish the walls, recondition the steel roof structure and install a new roof. Later that year, FOTT won a historic preservation grant to install new doors and windows. In 2012, with the help of a City of Tybee Island loan and the generous support of individuals, foundations and drew plans for the final restoration of the auditorium. And in 2015, the theater restoration was completed, with air conditioning, seats, a gorgeous stage and an office upstairs. A Georgia Council of the Arts grant helped recreate the historic marquee and box office. And, finally, a commemorative engraved brick plaza and walkway was built to welcome the community back to this beloved historic landmark.